4 Star Properties, LLC is a well established, locally owned property management company. 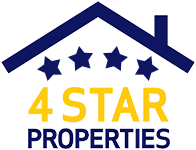 4 Star Properties, LLC provides outstanding rental homes with superior landlord service in the greater St. Louis and St. Charles areas. We provide reliable property maintenance; we have a full-time maintenance manager and hire only highly reputable maintenance sub-contractors. Our tenants are very important to us and we strive to provide a quality rental houses where tenants feel at home. If you love your rental home so much that you would like to own it, we offer the option to Rent-to-Own with a locked-in purchase price, rent credits toward purchase, and great lender connections.